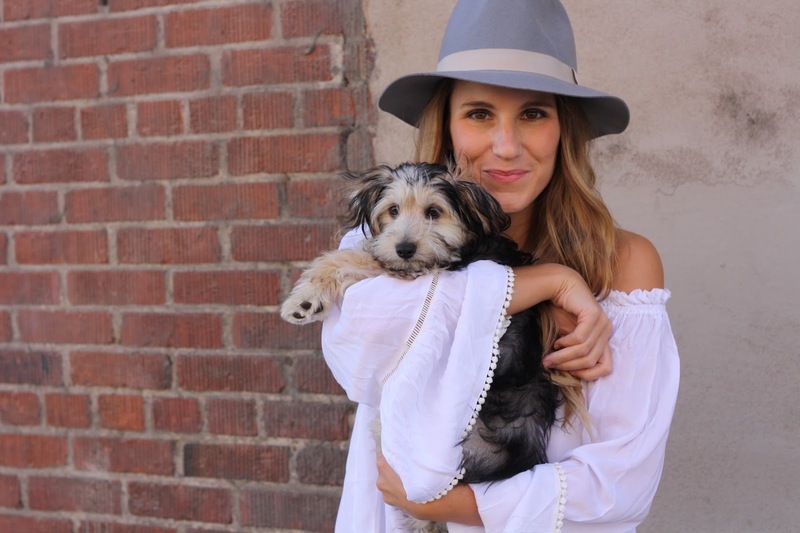 Boho Off the Shoulder + Meet Stella! Although this has been a short week, it has felt much longer. I’m getting back into the swing of things at work, but forget how tired I am after a long day with a room full of first graders! I’m definitely ready for my weekend already! 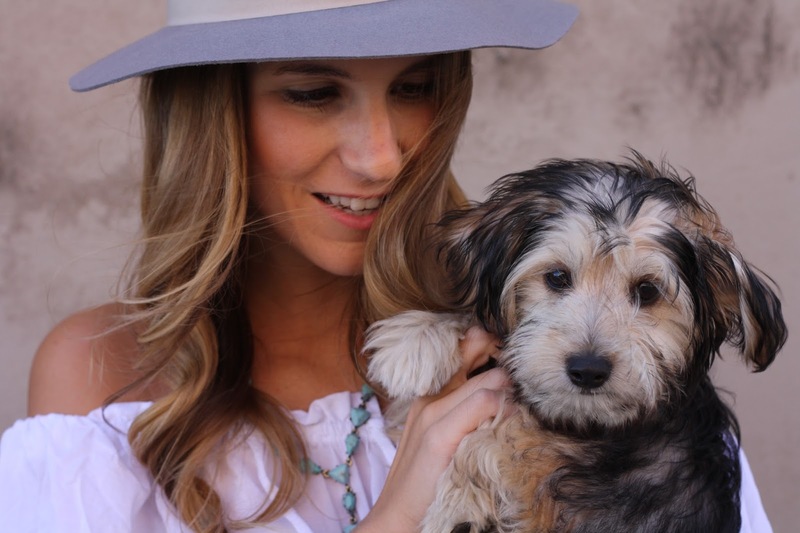 Today I am introducing you to E and I’s newest family member…Stella! We’ve been wanting a dog for a while, but wanted to wait until we settled in to marriage before starting to look. You know what they say though, things always fall into your lap when you are least expecting it! Stella has quickly become our little baby. She is around 4 months old and a mutt (a little mix of a bunch breeds). She is just about the sweetest thing, but as a puppy, she definitely has her naughty side! She makes up for it though with her sweet cuddles at night…her favorite place to sleep is at the tops of our pillows! This week’s blogger of the week from last week’s link-up is Susie of Sequins & Strawberries! Susie’s tulip hem dress has the prettiest and color palate! I love that she paired it with a hot pink clutch and cognac shoes! This is definitely a look I wish I could wear lakeside! Love everything about this look, especially your adorable top! Stella is so adorable! Congrats on the newest furry addition to your house. 🙂 I'm loving the off the shoulder trend so much–especially how you've styled it! Love her style! If you still haven't – come join the huge GIVEAWAY I am hosting for the THE KEWL SHOP till Sept. 12 where a $150 dress value is at stake! Loving that top! 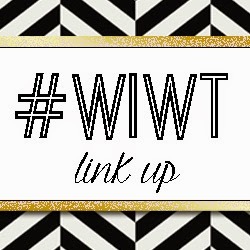 I also joined the link up! Yay! Give me all off the shoulder tops! Love it! And how adorable is Miss Stella?! I just want to snuggle her all day! Sweet girl! YES! I love your darling Stella!! I love your outfit and your puppy is the cutest! Oh my gosh Stella is so cute! I totally know what you mean about a naught side, my puppy is so sweet and simultaneously so naughty. I love this look on you, casual and so chic! Oh my goodness! Hi, sweet baby Stella! Hope you're all having an easy transition. Your outfit is adorable, as always! I feel like you have to be the best dressed teacher at your school. Stella is simply adorable! I'm waiting to get settled before I get a dog too (that will probably be in the far future lol). Also loving the off the shoulder top! Your puppy is the cutest! Also I am loving your look — so fun. I am loving that outfit so much, that top is so cute! Such a great linkup! 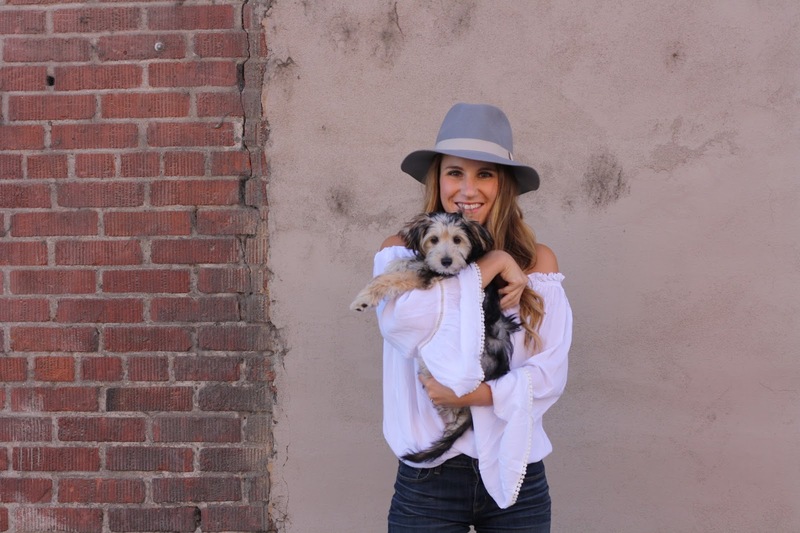 These are the absolute cutest photos of the outfit, and even more with the cute pup! Love, love, love! STELLA! <3 I love her! Love this top on you, too! OOOOOOOOOOOOH MY GAWWWWWWWWWWD! What a cutie!!!! Your dog is so precious! I love dogs, good luck!!!! And your shirt is gorg! STELLLLLAAAAA, omg, what a cutie!! And I'm so obsessed with this top on you! Stella is perfect… as is this top!! Love! Awe Stella is freaking cute! She makes the perfect fur baby (and accessory lol) I'm loving this outfit though! It is so perfect for the last hot months of summer. I love this look! I'm super obsessed with the boho look now! I love this boho chic look! I wish I could pull it off!